I am writing to express my profound concern with your recent reporting regarding the disputed Iranian nuclear program and how it relates to U.S. foreign policy. On two recent occasions your reporters have refered to Iran’s, “Nuclear weapons program” (Jeff Brown, October 22) and Iran’s, “Pursuit of nuclear weapons”, (Ray Suarez,10/5/12 ). No is no evidence for this, as repeated statements by various Iranian officials, many reports and inspections by the IAEA, and even the most recent U.S. government NEI report concludes that Iran has not yet decided whether or not it will pursue a weapons program in the future. On top of all this, U.S. Defense Secretary Leon Panetta stated that Iran is not trying to build a nuclear weapon on Face The Nation, 01-08-12. It is the responsibility of journalist to investigate the claims made by power and report on what is known versus claims that are made. In this case, the careless reporting of a set of claims about a supposed Iran nuclear weapons program is presented as established fact, a dangerous and irresponsible folly in light of past history, most notably the WMD claims that led to the Iraq War. If anything, journalist should be extra critical of similar claims made about Iran due to there lack and complicit role in the run up to the destruction of Iraq. I look forward to hearing back from you and seeing a correction made in your reporting in regards to Iran. The attack of the Gaza Freedom Flotilla by the Israeli Defense Forces and the subsequent killing of between 10-20 activists with upwards of 50 injured has sparked protests and outrage around the globe. Israel has taken one more step down the road of de-legitimization in the eyes of the world. Whatever the power calculations were made before the authorizing of this operation in the Israeli government and the IDF, it seems clear that the result has been to isolate Israel even more in the international community and take a step closer to joining the ranks of outlaw regimes the like of apartheid era South Africa and North Korea. While Israel still enjoys the patronage of the most powerful state in the world, the US, it is steadily adopting an ever more untenable position. US support is not indefinite and without some conditions, however modest these may be. The way the Israeli government has been acting lately, with a total disregard to international law and conventions, with impunity to the human rights of millions of people stigmatizing them in the eyes of a vast majority of the world, and even with calculated snubs aimed at its US backer, it seems as if the leadership of that country has become completely blinded by its own hubris. Israel’s nemesis may be coming sooner than later. The upcoming election in Colombia on May 30th has been surrounding by an expectation of change in the country. This atmosphere has been growing over the past few months as current president Alvaro Uribe was denied the possibility to run for a third term in office due to a ruling by the constitutional court. His annointed successor and former defense minister, Juan Manuel Santos seemed assured of an easy victory, but has slipped considerably in the polls as of late due to recent scandals and a growing sense of a need for a break from the status quo. Santos’ fall in the polls has corresponded with a rise for the Green Party candidate, Antanas Mockus, whose campaign has captured the imagination of a large segement of the Colombian urban population. The attitude in the vast rural sectors of the country, where the decades long civil war is still taking place, is less well understood. As the election date draws nearer the Colombian people are potentially bracing themselves for a change of political leadership that is a departure from the regional isolationism of the Uribe years. Reproachment with Venezuela and Ecuador (which was experienced a cross border military raid by the Colombian Armed Forces in 2008) figures to be significant possible outcome in the event of a Mockus victory. Question: What is at stake in this election in Colombia? Natalia Springer: What is at stake is the transition to avoid another cycle of violence. Either we go to a transition to a real, sustainable peace where not only violence but the structural reasons that have provoked this violence are addressed. Or we are into a new wave of violence. This is what is at stake. Question: Some of the violence is down in Colombia but you have said the violence numbers don’t tell the whole story. What do you mean by that? Natalia Springer: Reality is very complex in Colombia. On one hand it’s true, for example, that violence we experienced in the past in Bogota is down. There was a fight against violence and that fight has rendered some very good numbers. But the war in other regions of the country is not over and you have the impression it’s getting worse. In the south and in the pacific regions, around the area of Buenaventura, for example, violence is still very bad. So the impression we have is that certain numbers have went down, for example kidnappings and the big impact violence is down. But on the other hand, displacement has been growing a lot, poverty and extreme poverty, too. Seventeen per cent of Colombians live in the streets. It’s extreme poverty. Forty-six per cent of Colombians are poor or extremely poor. And inequality has grown dramatically in our country. Question: But the current Colombian government has implemented some aid programmes for the poorest people. How do you view those programmes? Natalia Springer: The government really went hard for granting some sort of help to very poor people, familias guardabosques is one example. These efforts were supported by much of the international community. It’s a kind of programme that gives help to poor people in the form of money. But it has not helped poverty, it has made poverty worse. Because people were getting money from the state, but it was not helping them get out of poverty or get work. So labour conditions did not improve. And foreign investors were given incentives to invest in Colombia, but that investment had no impact in the quality of labour for the people. Question: Let’s switch back to Sunday’s election. What are people voting for? Natalia Springer: Change. The country has reached a point where we cannot stand another scandal. Especially since the amount of scandals in this government have gone over the reasonable limits. Every government has a scandal; politics is the exercise of reality. However it’s very difficult to stand the scandals that have hit this country. We cannot stand this anymore. You can feel it all around. People might feel some certain sympathies for the efforts of our president, President Uribe, but we are all fed up with all those scandals. We don’t see truth, we don’t see transparency, we do not see justice acting but being obstructed. So I think this campaign has been very much influenced by the sense of outrage. Question: You speak with a positive tone about Antanas Mockus – candidate for president. He has sky-rocketed in the polls in recent weeks to where he and Juan Manuel Santos are the clear front runners. What is it about Mockus that so many people, especially the youth, are gravitating to all of a sudden? How do you explain his fast rise in the polls? Natalia Springer: Mockus has talked a lot about education and his plan of legality, institutionalisation, and revolution of education and this is what has caught so much attention. It’s a sense of love of country. What is so new about him is that he is not making a campaign on money, or friends, or the usual elites that controlled the politics in the regions. He is just going alone – with the best brains of this country – around Colombia talking about legality, education, health, poverty and telling the truth. And that is what has made him so attractive to many people. Question: What is different about this election from others in Colombia? Natalia Springer: We are not afraid anymore. Violence is not commanding this election. And I am not talking about the last two elections. I am talking about last 5 or 6 elections Candidates were killed systematically by guerillas or the paramilitary in the past. We didn’t have peaceful elections; we could not decide freely. And this is the first time we are really deciding over matters of national interest and not matters of fear. Issues such as health, education, international affairs. These are the central points of this election. Question: Finally, you said this could be one of Colombia’s most interesting elections ever. How so? Natalia Springer: Four months ago if you asked me how I see this election I would say it was really boring. At the time we thought the re-election (third term) of President Uribe would happen. He would be allowed to run again for another term. But once the Constitutional Court decided this is no longer an option, the entire country suffered a revolution. And we started one of the most interesting campaigns ever. We have seven or eight candidates with wonderful qualities. But just four months ago people were saying, ‘It has to be Uribe, we have no other leader.’ And Uribe was seen for many as the savior, a maximum leader, a figure that represented everything for us and if he left we would be left in fear. But right now, the discussion is very different. In this campaign we are being allowed to make a critical, transparent evaluation of these past two terms and now we are able to see the past eight years critically. And see what he really achieved and really represents, and what is the vision for the Colombia we really want to have. Amid an investigation into just how cosy the relationship between a government oversight department and the oil industry was, BP is getting ready to attempt a so-called “top kill” manoeuvre to choke off the gushing oil leak in the Gulf of Mexico. As early as dawn on Wednesday, the oil company will try to choke the gusher with heavy drilling mud and cement – a tactic called a “top kill” that has been used above ground but has never been tried 1,500 metres underwater. Patience is running out and anger has been growing over the oil giant’s inability to stop the oil leak that sprang more than a month ago after an offshore drilling rig exploded on April 20. Eleven workers were killed in the blast and by the most conservative estimate, 26.5 million litres of crude have spilled into the Gulf of Mexico, fouling Louisiana’s marshes and coating birds and other wildlife. Engineers were doing at least 12 hours of diagnostic tests on Tuesday, checking five spots on the well’s crippled five-storey blowout preventer to make sure it can withstand the heavy force of the mud. Wells said it could take anywhere from a few hours to two days to determine whether the top kill was working.Tony Hayward, BP’s chief executive, said chances of the top kill succeeding were 60 to 70 per cent, while Kent Wells, a BP senior vice-president, said the procedure could be delayed or scuttled if Tuesday’s pressure readings were poor. Once the results of Tuesday’s diagnostic tests are in, BP said, it will consult with government officials, including scientists with the Minerals Management Service (MMS), before deciding whether to press on with the top kill. The investigation follows a report citing workers from the MMS – which is under the interior department – accepting gifts and possibly allowing oil workers to fill out their own inspection reports. “This deeply disturbing report is further evidence of the cosy relationship between some elements of MMS and the oil and gas industry,” Salazar said in a statement. Salazar, whose interior department has been criticised in recent weeks for not doing enough to prevent the oil rig explosion, said he had directed the agency’s acting inspector-general, Mary Kendall, to look into whether MMS employees adequately inspected and enforced standards on the Deepwater Horizon rig. Salazar and Kendall are set to testify before the House of Representatives’ Natural Resource committee on Wednesday on the oil spill. Some 140,000 square kilometres of water – an area slightly smaller than the size of Greece – are now closed to fishing, the National Oceanic and Atmospheric Administration said, but added that 77 per cent of the Gulf remains open. The “top-secret” minutes of meetings between senior officials from the two countries in 1975 show that South Africa‘s defence minister, PW Botha, asked for the warheads and Shimon Peres, then Israel’s defence minister and now its president, responded by offering them “in three sizes”. The two men also signed a broad-ranging agreement governing military ties between the two countries that included a clause declaring that “the very existence of this agreement” was to remain secret. The significance of this revelation is that it is the first documentary evidence that Israel possesses nuclear weapons. It is an open secret that Israel has for years been in the possession of (an estimated) 200 nuclear warheads, although its official policy has always been a refusal to either confirm or deny nuclear capabilities. Or rather that it would not be the first country to “introduce” them to the Middle East, meaning that it would possess them and let everyone know it, but refrain from making it official policy. The exposure of the documents between Israel and apartheid-era South Africa is damaging on two fronts. First, retroactively in the respect that Israel was ready to pursue a policy of proliferating nuclear weapons to non-nuclear weapon states. 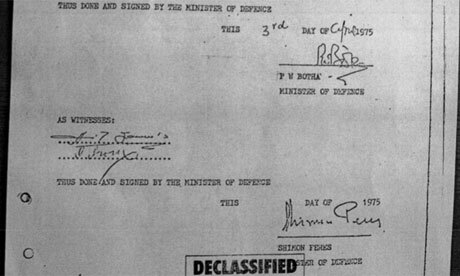 Although the deal fell through due to costs on the South African side, it is a damning indictment of past Israeli state actions and the willingness to cooperate and foment the dissemination of weapons of mass destruction to other states, which is bad enough own its own but takes on a somewhat more unpalatable moral taint when the state in question was the racist and oppressive apartheid regime in Pretoria. Granted, condemning a state for its past actions is often a more than useless effort, for though the present is built on that past, it is also free from it in that it has its own prerogatives and responsibilities to answer for in the here and now. But it worth noting that it is not some distant past that is being condemned, far disconnected from today’s Israel; indeed some of the key political figure in power in 1975, such as then defense minister and now Israeli president Shimon Peres, are still at the top of the government today. Secondly, the matter of possessing nuclear weapons is clearly quite relevant both in the context of Israeli politics and the broader regional relations of the Middle East. One of the main themes that continues to surface in domestic Israeli politics is the threat that Iran poses to the Jewish state, specifically in relation to the Iranian uranium enrichment program, which Israel, the US, and more broadly Europe maintains is aimed at developing weapons-grade material, an allegation which Iran has vehemently denied. The Iranian position has been backed up by a systematic lack of evidence from its accusers as well as multiple reports from the IAEA that there is no evidence for such allegations. To go further, the latest US intelligence estimates on Iran have discounted the possibility of Iran having an active nuclear weapons program and stated that the emergence of one in the near future is not a pressing threat. But leaving the Iranian program aside, the stance of Israel (and its US sponsor) is hypocritical for a number of reasons. Iran is a signatory of the Nuclear Non-Proliferation Treaty along with every other country in the world outside Israel, Pakistan, India, and North Korea. As such it nuclear facilities are open to inspectors of the IAEA and it is part of the established international framework for nuclear regulation. Israel has decided to remain outside of this international consensus and thus is far more of a rouge state in this sense than Iran. A rouge state with nuclear weapon capability. Secondly, Iran has attempted numerous times to pass declarations in the UN general assembly to declare the Middle East a nuclear free zone, something that one would think would be welcomed by all parties involved that share in the desire to see a safer and more peaceful world. These efforts have been routinely blocked by Israel and the US as they are a direct reference to the nuclear arsenals that the two countries maintain in the Middle East. So we have the scenario where a country that has no nuclear weapons and is calling for the establishment of a nuclear weapons free zone in the region (Iran) is being threatened with attack and sanctions for having the possible potential of developing nuclear weapons at some unknown future date by countries (Israel, US) that actually do possess nuclear weapons, known for their historically aggressive military tendencies, and in the case of Israel, remain outside of all international law and regulations regarding nuclear weapons. It is hard to fit all the twists and turns into one coherent sentence, but the hypocrisy of the situation should be clear to all. Without being an apologist for the Iranian regime, Iran is entitled to rights as a signatory of the NPT and one of those rights is the free development of nuclear technology for peaceful purposes. Israel, in seeking to contain the regional influence of Iran, which in economic or military terms is certainly far less than its political and rhetorical means, has been taking a stance that is not tenable. The majority of the world is on the side of Iran in this matter and the days of the US calling the shots, often though its client proxy states such as Israel, are coming to an end. The Israeli hawks see a nuclear Iran as a worst possible scenario, but the downward spiral that Israel is currently experiencing both domestically and internationally is due to its many internal contradictions, not least of which are the ongoing occupation of the West Bank and the Gaza Strip, the development of an apartheid society both within the Occupied Territories and within Israel proper, as well as the aforementioned nuclear hypocrisy, is slowly but surely bringing the world together in opposition to the Zionist regime. This is true of it traditional opponents, such as the masses of the Muslim world, as well those who have traditionally shown support for the Jewish state in Europe and elsewhere. As Israeli exceptionalism grows it only serves to turn the Jewish state into a pariah in the eyes of world. Paul Woodward has been following this story and provides more analysis and information on his War In Context site. As always I recommend a visit to his site for the latest on this story.